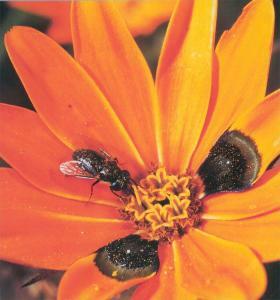 A capitulum of the South African "beetle daisy" (Gorteria diffusa: Asteraceae). The dark raised spots on the ray florets are strikingly similar to the bee-fly (Megapalpus nitidus: Bombyliidae) that pollinates this plant. Experiments show that bee-flies are more strongly attracted to capitula with spots than capitula in which spots have been removed.